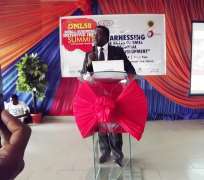 TOTAL, SME-DN SUMMIT: UNACHUKWU HARPS ON SME’s FOR RAPID ECONOMIC DEV. Engr. Emeka Unachukwu has said Nigeria's quest for rapid economic development will be achieved through the proper development of the small and medium enterprises (SME's) saying the sector remains the bedrock for economic development of any serious nation. According to him no country can achieve its desired growth without its government providing a genuine environmental condition for the players in SME's sector to thrive. Presenting a paper titiled: “Harnessing the Roles of SME's Regional Economic Development”, said “the only way you can develop a place is to develop SME's and one way to develop the country is what the people of Egi has started from the grassroots”, adding that every other part of the country should come to Egi and learn. “What you are doing in Egi, if it works will contribute to the progress of the country. What you are doing today is in the plan of the government but government does not know how to start it”. While commending Total E&P and other corporate bodies that have put strategic plans for the light of economic development to shine in Egi town, he called for more commitment to the SME's sector adding that is imperative for a nation's development. “In Nigeria 31 million people are engaged in SME's and this sector holds 80 per cent of the total enterprises but regrettably it contributes as little as one percent to the total GDP. He, however , said the story was quite different from what was obtainable in advanced countries, like in the Asian countries where SME's contribute 40 per cent of GDP while in Europe and the United States (US), SME's contribute 50 percent to GDP. The PHCCIMA helmsman commended Total E&P and other corporate bodies that have put strategic plans for the light of economic development to shine in Egi town. Head of Sustainable Development, Total E&P, Mr. Chika Chinwah in his remark said “Total Exploration and production Nigeria encourages partnerships amongst local actors to make sure the local population shares in the benefit of economic growth resulting from the company's activities. Chairman of the SME-DN Board of directors, Mr. Cyprian Ojum said Total E&P is making significant economic impact in Egi through small & medium and scale enterprise network SME-DN.